At St. Joseph’s Children’s Hospital, we are committed to providing everything needed for the health and well-being of children in a family-friendly atmosphere. A team of pediatric rehabilitation specialists will be assembled to address your child’s needs and may include an audiologist, occupational therapist, physical therapist and/or speech therapist. Treatment is personalized to each child’s needs, and family participation is always encouraged. Learn more about the types of rehabilitation therapy and our Wheelchair Seating and Positioning Clinic. 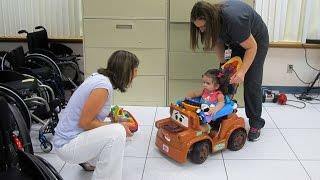 St. Joseph’s Children’s Hospital offers pediatric rehabilitation services at various locations to meet family needs across our community. For a physician referral, please call 1-800-BayCare (1-800-229-2273) or find a doctor near you. A young girl with special needs discovers freedom and mobility thanks to an electric car fitted just for her at St. Joseph's Children's Hospital.